When the Conclave elected Angelo Giuseppe Roncalli to the Chair of Peter in 1958, many thought the elderly cardinal would be a benign placeholder for a few years, allowing the Roman Church to catch its breath after the long pontificate of Pius XII, the end of the hot war and the tensions of the cold. Such was not to be the case, and John XXIII, practically off the bat, called for the first major Council in years, which led to a startling number of reforms whose impact is felt to this day, fifty years after his death. Let us pray. Lord of all truth and peace, you raised up your bishop John to be servant of the servants of God and gave him wisdom to call for the work of renewing your Church: Grant that, following his example, we may reach out to other Christians to clasp them with the love of your Son, and labor throughout the nations of the world to kindle a desire for justice and peace; through Jesus Christ, who lives and reigns with you and the Holy Spirit, one God, now and for ever. Amen. 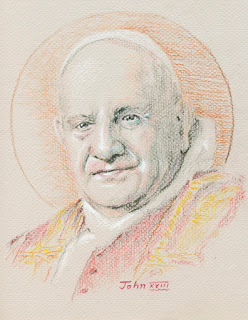 The icon in watercolor pencil is an attempt to capture his generosity of spirit, with the suggestion he is about to break into a smile and give a little wave of benediction. We need more church leaders like "Good Pope John." Your best icon yet; the purity of his soul shines through. May Francis be his successor. I must agree with John. The icon is remarkable in that the instant I looked at John's face, I saw through it to God. That's the purpose of an icon, right? Usually, I have to gaze for a while before the transformation happens. Alas, with some icons, it never happens. Thank you, John and June. I really feel I must attribute this more to the model than anything else, though if God has blessed me in this with a ready hand I give thanks!